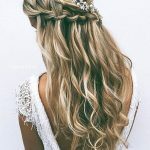 Home » Popular Hairstyles » Cute Braided Hairstyle for Girls: Fishtail Braid!!! This cute and ultra-trendy ‘bed-head’ look is styled to appear as if you haven’t brushed your hair for several days! Every hairstyle sends out a message and this one says that the normal rules of mainstream fashion and business formality are being ignored in favour of individual style and quirky originality! The hair is swept back from the face, without brushing, and braided into a loosely woven, fishtail braid. The messy plait is carelessly secured at the end with a plain elastic band and then roughly tousled to create a pretty halo of wispy hair framing the face and apparently escaping from all sections of the hair. This super-casual look completely subverts the idea of order, so enjoy its fabulous, relaxed Boho trendiness – but try not to wear it when you ask your bank for a business loan! Find more cool hairstyles on our site.